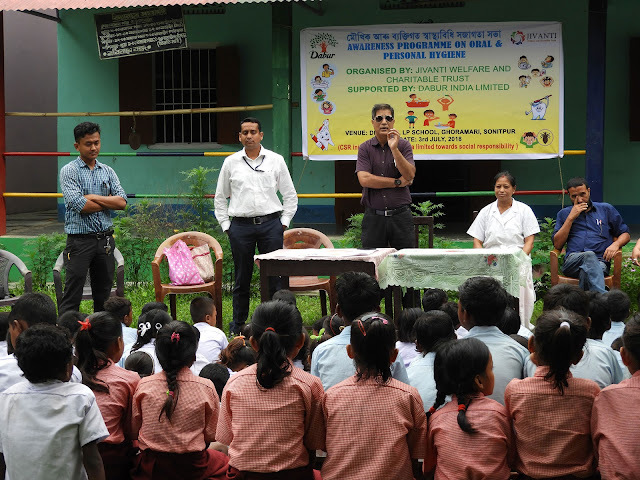 New Delhi, July 24, 2018: Strengthening its community development initiatives in Assam, the country’s Science-based Ayurveda major Dabur India Ltd today announced a mega health awareness campaign that seeks to educate school-going children in Tezpur about best Oral and Personal Hygiene practices. The first of its awareness camp was organized at the Dhekidol Lower Primary School, which saw participation from 158 students from four schools in the neighbourhood. The camp, organized by Dabur’s CSR arm Jivanti Welfare & Charitable Trust, sought to improve the oral health of school kids and create awareness about Ayurveda and Ayurvedic remedies for dental and oral care. School kids from Dhekidol Lower Primary School, Binapani Lower Primary School, Sesa Panbari Lower Primary School and Chapaguri Lower Primary School participated in the camp. As part of this programme, the children were also educated about the good personal hygiene practices like regular and proper bathing, trimming of nails, washing hands with soap, besides maintaining cleanliness within their household and school. "What is that life worth which cannot bring comfort to others." These inspiring words from Dabur India Ltd Founder Dr. S. K. Burman have been the guiding light behind Dabur's social development initiatives. Dabur has been involved with community development work since 1994, seeking to bring about an enduring change in the lives of people and to create the right environment for driving the local economy. Our Oral Hygiene initiatives alone have covered nearly 40 lakh kids across India in the past one year. Dabur India Limited is one of the leading FMCG companies in India. Building on a legacy of quality and experience for over 134 years, Dabur is today India’s most trusted name and the world’s largest Ayurvedic and Natural Health Care Company. Dabur India’s FMCG portfolio includes five flagship brands with distinct brand identities -- Dabur as the master brand for natural healthcare products, Vatika for premium personal care, Hajmola for digestives, Réal for fruit-based drinks and Fem for fairness bleaches & skin care.